Hey! Say! 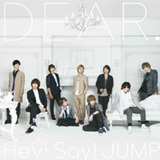 Jump - Dear.